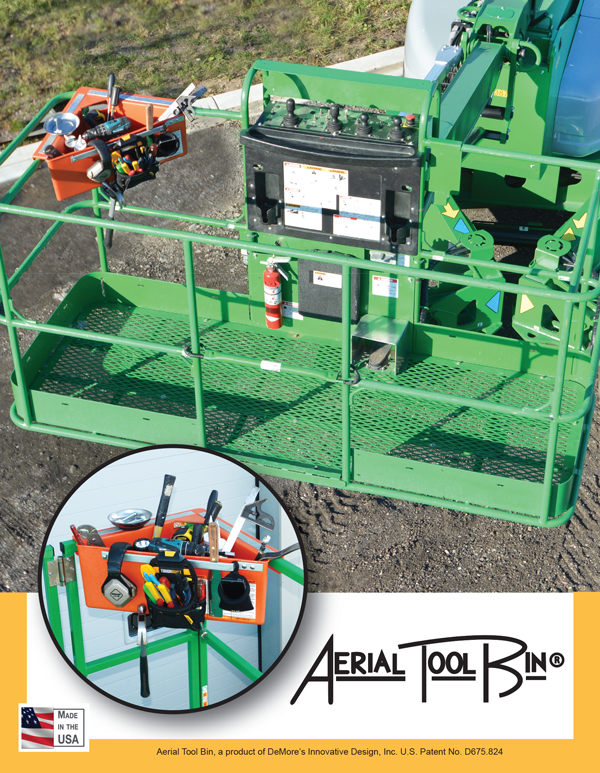 All About Aerial Tool Bin a Job Site Safety Product that everyone has been waiting for. 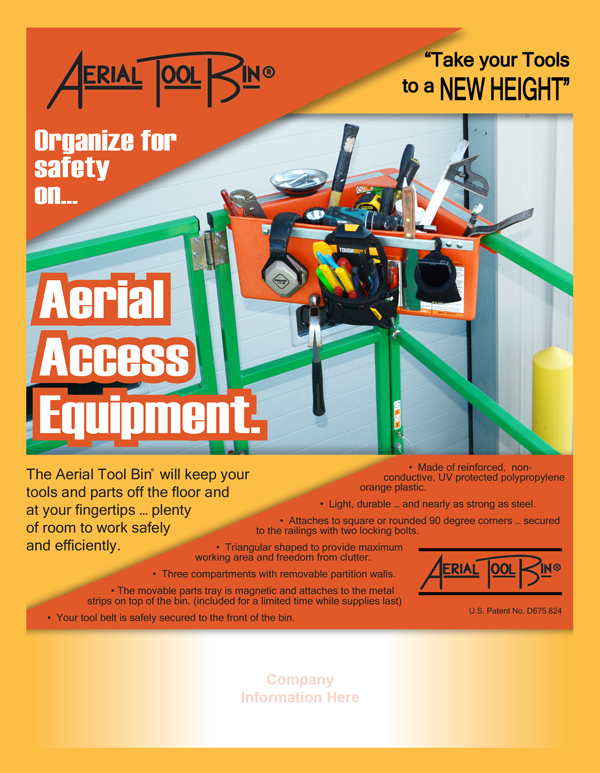 Follow this link to our new Product Flyer a quick view of a great Job Site Safety Product the Aerial Tool Bin. The Aerial Tool Bin was inspired out of necessity by a 34 year construction expert. He witnessed many injuries through his career in the construction industry. Back injuries were among the most prevalent, many of which were incurred while working on aerial access equipment. The injuries became increasingly aggravated when OSHA rules required safety harnesses to be worn when working on most aerial lifts. The safety harness constricted bending movement and caused a conflict with tool belts; another reason to find a way to minimize bending and relieve workers of cumbersome tool belts. 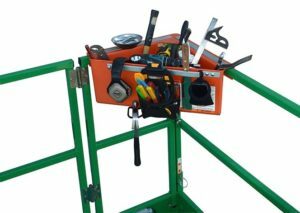 The Aerial Tool Bin allows you to “take your tools to a new height” while allowing maximum working space inside the lift, it also provides ample room to hold and organize enough tools at waist height for the task at hand. No more bending or reaching into a bucket full of disorganized tools. The triangular shaped Aerial Tool Bin is made out of reinforced, high-density, non–conductive, UV protected, light-weight, durable, orange polypropylene plastic and can withstand temperature changes from -20° up to 120°. 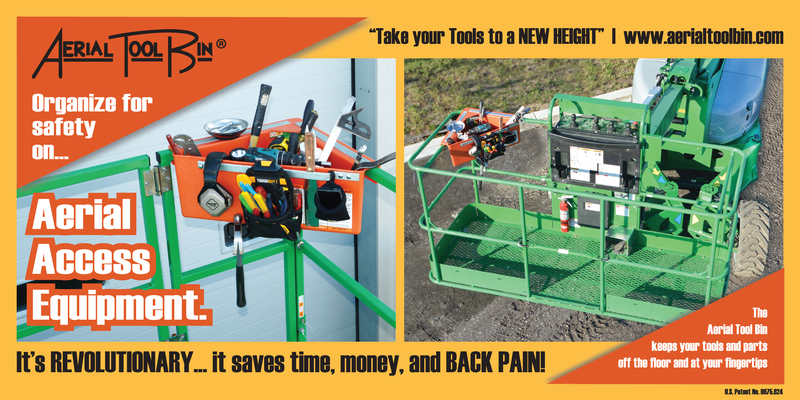 The Aerial Tool Bin has reached world-wide construction workers who work on aerial platform lifts, scissors lifts and boom lifts. I feel my products will have a positive impact on the industry by helping people work more efficiently while at the same time preserving their health. Overall it will make for a safer, healthier working environment on the job or around the home. DeMore’s Innovative Designs’ goal is to help as many workers in the construction, utility and maintenance industries to improve on accident prevention, job efficiency, and body related stress; while helping employers meet overall project and financial goals. Radio interview from the Biz Connection. Follow this link to listen to my interview as well as many other 5interviews on the Informational Show the Biz Connection. The Aerial Tool Bin and the Ladder Tool Bin was inspired out of necessity by a 34 year construction expert; now known as The Tool Bin Man. He witnessed many injuries as well as inefficiant practices through his career in the construction industry. Back injuries were among the most prevalent, many of which were incurred while working on aerial access equipment …! He witnessed many near miss accidents due the ocasional tool left on top of a step ladder…! 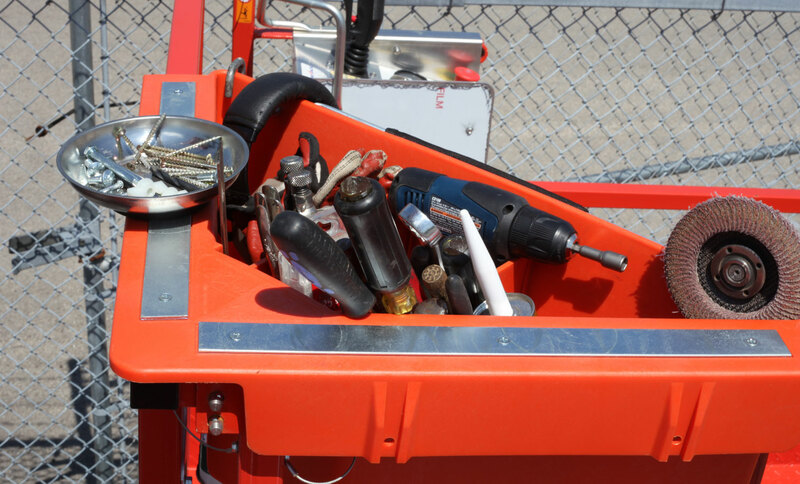 The Aerial Tool Bin and the Ladder Too Bin can help eliminate these injuries and enhance the efficiency of workers world wide! Copyright © 2014 Aerial Tool Bin, Milwaukee, WI. All Rights Reserved.